We had our first movie outing to a real movie theater over the summer to see Despicable Me 3. Armed with a big bag of popcorn BabyCakes sat through the whole movie! We really enjoyed it. 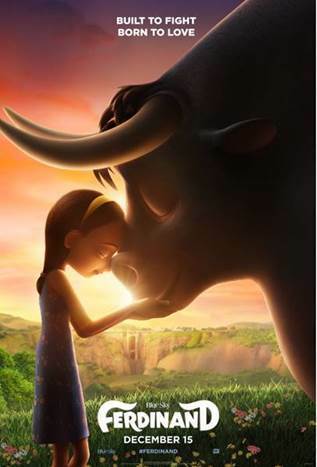 During the previews for the movie we saw the trailer for FERDINAND, the story of a giant bull with a big heart. After being mistaken for a dangerous beast, he is captured and torn from his home. Determined to return to his family, he rallies a misfit team on the ultimate adventure. Set in Spain, Ferdinand proves you can't judge a bull by its cover. The movie comes out December 15th, but the FERDINAND team has offered me tickets to an advance screening of FERDINAND on December 9th at UA Riverview (1400 S Christopher Columbus Blvd, Philadelphia). Enter to win tickets in the Rafflecopter widget below! Winners will be notified by 12/6.